2018 has been a dry year, not favorable to fungi production. 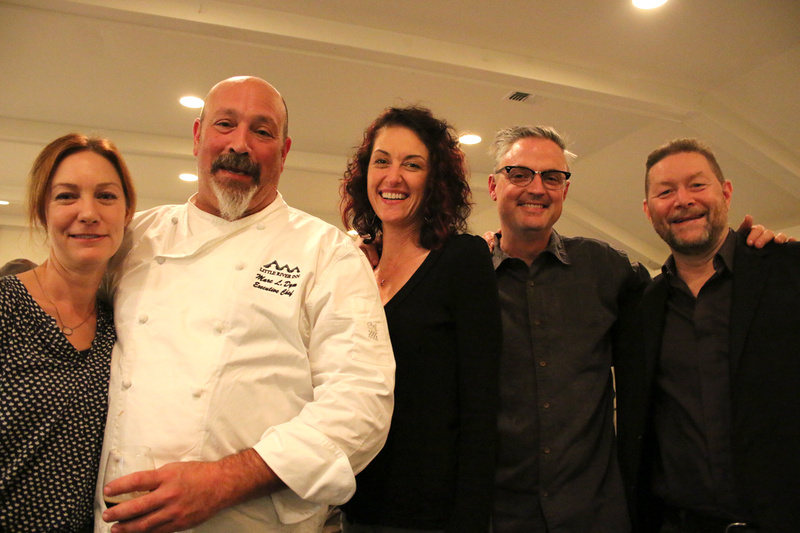 Fortunately we did have some rain on the coast mid-September and Chef Marc Dym, who along with his wife Cally, own and operate the Little River Inn (she’s a fifth-generation inn keeper), was able to secure wild mushrooms locally and through purveyors for the coming dinner. The hard part is always what to do with them. Guests for this year’s extravaganza (it’s always a sell-out) were greeted with a passed appetizer fritter featuring abalone, corn and shiitake mushrooms. All courses for this continuing event are paired with beers from the Russian River Brewery in Santa Rosa and now Windsor. Owners Vinnie and Natalie Cilurzo are always in attendance and oversee the pairings of their beers with the creations of Chef Marc. The unbelievably wonderful fritter was offered with a glass of Russian River’s Dribble Belt Hoppy Session Ale (at 4.75% abv). A very tasty way to begin the evening indeed. Guests for this year’s extravaganza (it’s always a sell-out) were greeted with a passed appetizer fritter featuring abalone, corn and shiitake mushrooms. The next course was an Arancino rice and cheese ball featuring Cypress Grove Truffle Tremor goat cheese and roasted butternut squash pureé. Oh boy. The rich cheese and squash puree and seasoned rice begged for a beer that was crisp and refreshing and the Russian River STS Pils (at 5.35% abv) was perfect. 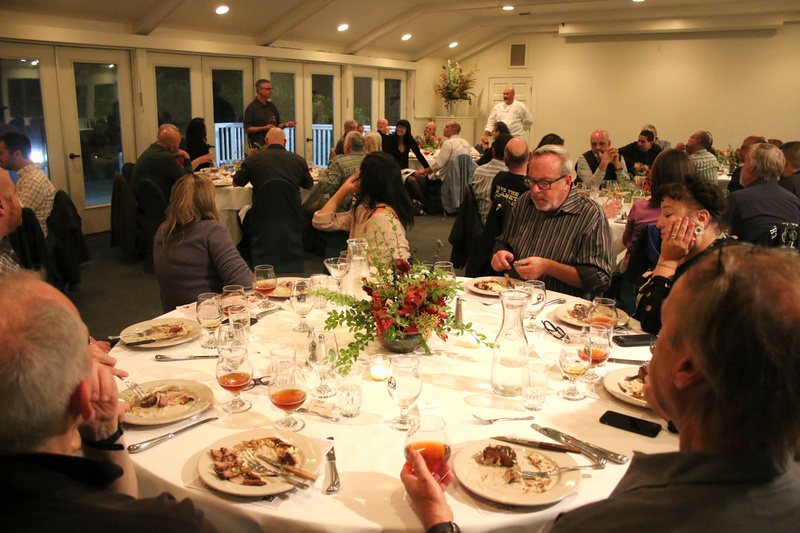 The STS is one of Russian River’s most popular beers (along with Pliny the Elder of course) and was among several beers at the dinner proudly presented from the new brewery in Windsor. Marc’s Mushroom Consommé with morel mushrooms and snipped chives was the next course on offer. By now most are familiar with the story of how Marc won Cally’s affection via his stunningly complex yet deceptively simple consommé soup. This was accompanied by Russian River’s superb nod to the Belgian golden ale tradition Damnation Strong Golden Ale (at 7.75% abv). The portions served at the dinner are, shall we say, generous but most bowls went back empty. Speaking of generous, the next course was a Mosaic of Seared Scallops with golden chanterelle, Brussels sprouts and bacon hash and, considering the price of scallops these days, I’m guessing food costs were not a primary consideration. Wow! Several years ago, Marc and Fal Allen, brewmaster at Anderson Valley Brewing Company, collaborated on a beer for Little River’s 75th anniversary and they have been making it ever since to serve at the inn and to incorporate into the dinner. Together, they decided on a saison to be brewed with candy cap mushrooms. The result was and continues to be a standout. The Anderson Valley/LRI Collaboration Saison 75 might still be available at the brewery and at Little River Inn. The next course was a splendid food/beer pairing featuring a Wild Boar & Porcini Meatball with slow braised white beans and greens smartly served with Russian River’s famous Blind Pig IPA (at 6.25% abv). The rich assertive flavors of the wild boar and full-flavored porcini mushroom was cleanly balanced by the hop-driven IPA. Well done, gentleman. The next course was a splendid food/beer pairing featuring a Wild Boar & Porcini Meatball with slow braised white beans and greens smartly served with Russian River’s famous Blind Pig IPA (at 6.25% abv). Perhaps the most stunning pairing was yet to come. 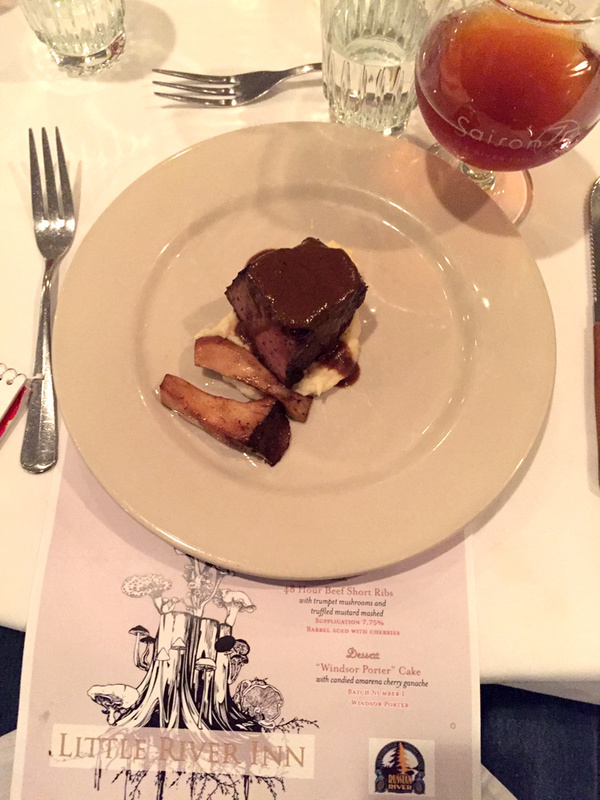 The 48-hour sous vide Beef Short Ribs with trumpet mushrooms and truffled mustard mashed potatoes was simply amazing. Paired with the Supplication barrel-aged sour beer with cherries (7.75% avb), the entre became transcendent. The interplay of the tender rich roasted rib begged for something equally assertive and the Supplication did not disappoint. Truly epic. Dessert consisted of an unbelievably rich Windsor Porter Cake (think chocolate decadence) with candied Amarena cherry ganache (you may need to look that one up) served with Batch No. 1 Windsor Porter, the first beer made at the new Windsor facility. Simply sublime. 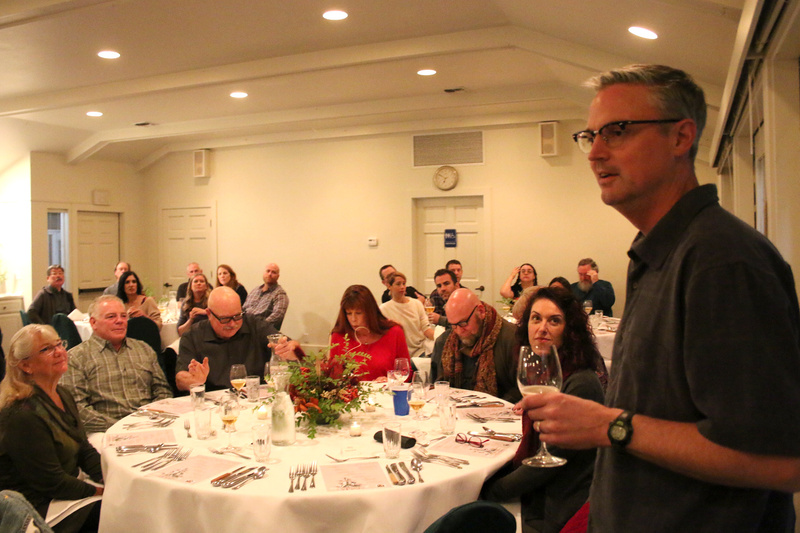 The attendees, a delightful blend of foodies, beer geeks and industry peeps, seemed to be well sated by the dinners end. 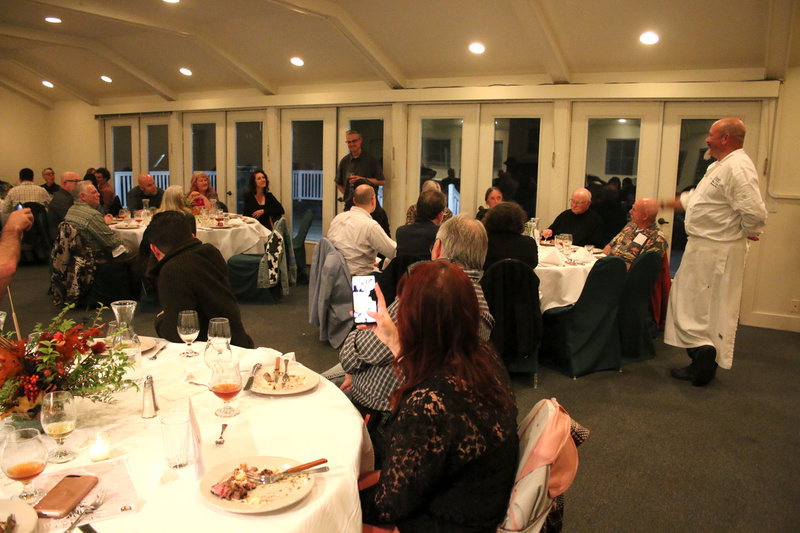 The party moved on to Ole’s Whale Watch Bar in the main house to discuss the finer points of what had just gone down. Most agreed that this event needs to be on the perpetual calendar. Information on reservations for the next Mushroom Dinner at Little River Inn may be found at littleriverinn.com. The new Russian River Brewery is located at 700 Mitchel Lane, Windsor, CA 95492.